Trinity Center (formerly Fresh Start) provides a safe and accepting refuge two days a week for our homeless community members and working poor. At Trinity Center, a Trinity Center member will find breakfast and a hot lunch. One can use the laundry and shower facilities. The center also offers mail service, access to telephones, clothing and toiletries, a food pantry, job postings, on-site counselors, and advocacy for social services. Perhaps the most important feature Trinity Center offers is a place for people without homes to gather in community. We adore our friends at Trinity Center and value them as members of our Walnut Creek community. Sleeping Bags, Tents, and Tarps: Every fall since CKC began in 2004, the Creek Kids have purchased sleeping bags, tents, and tarps for our friends at Trinity Center. Susan Prather, the founder of Fresh Start (now Trinity Center), reminded us when she was alive that by supplying these resources, people stay warmer through the cold and wet winter nights. Ultimately, these supplies help save lives. 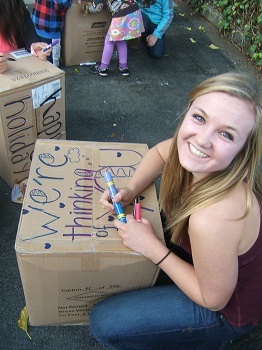 Before we box the sleeping bags, tents, and tarps to deliver to members of Trinity Center, we decorate the cartons with our warmest wishes. Holiday Angel Project: For the past six years, Creek Kids have participated in the Holiday Angel Project, showering Trinity Center members with gifts. Members submit their wish lists, and then Creek Kids, their families, and individuals shower them with gifts. Some practical — new boots, a camping stove, a bike helmet, or gas card. Some fun — a skateboard, Frisbee golf discs, even musical instruments. Breakfasts all year: Each month, Creek Kids donate money to cover the cost of breakfast two days a week for Trinity Center members. We are proud to be able to do this. 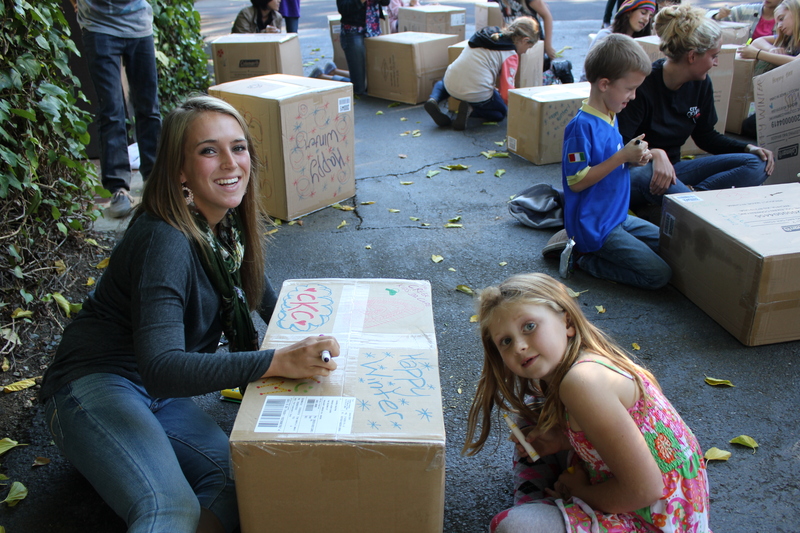 Drives: Our Creek Kids school groups organize drives throughout the year to meet the needs of Trinity Center members. We’ve done sock and undies drives, protein and water drives, toiletry drives, and lots of winter clothing drives.